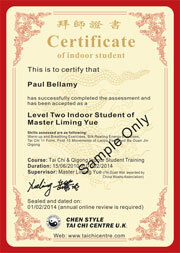 All indoor students under this listing are accepted by Grandmaster Liming Yue. The level of technique is required to be reviewed every years by Grandmaster Liming Yue at free of charge. We will remove the name from the list below for those who did not review their level of skill over a period of one year. The Centre will also not take any responsibility for their own activities and behaviours apart from proving their level of Tai Chi skills. The standard we used for the indoor student levels is according to the Wushu Duan Wei system implemented by the Chinese Wushu (Martial Arts) Association in China. Some of indoor students listed below have also achieved the Duan Wei grading from China Wushu Association as indicated. 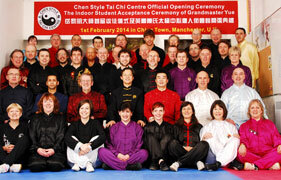 The Indoor Student Acceptance Ceremony will take place in the Tai Chi Centre or seminar venues by pre arrangement. All students should write a letter to request the acceptance of indoor student directly to Grandmaster Liming Yue by email or post. Fees: There will be a cost of £150.00 to cover the assessment, ceremony, certificate and photograph. 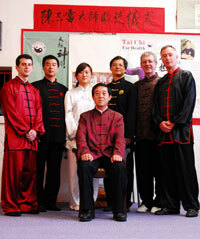 Suits: The suit is optional and it will cost £45.00; To wear your own Chinese Kungfu suit is acceptable on the day. Purpose & Benefits: The most important issue in Chinese traditional culture is a official recognition of relationship and responsibility between the Master and students. In general we will run a series of Indoor Students only seminar every year and it is restricted to public students. 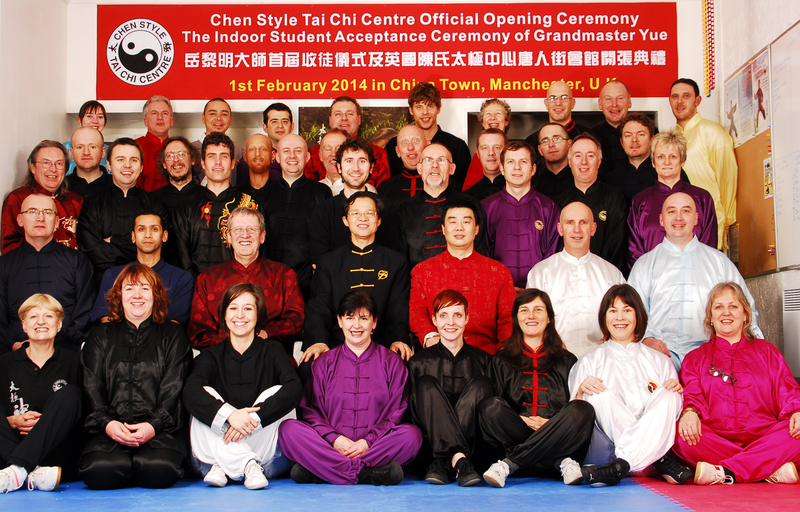 We will regularly host indoor student ceremony and seminars every year and it opens to the Chen Style Tai Chi practitioners worldwide. The following group pictures are just an example, to be replaced soon. Indoor Students within this level have learned Tai Chi for over three years and can practice Tai Chi Eleven Form or 18 form and First part of any long form such as , Laojia, 83 Form with Basic Push Hands. Indoor Students within this level have learned Tai Chi for over five years and can practice Tai Chi Eleven Form or 18 form and First 30 movements of any long form such as , Laojia, 83 Form with Push Hands and Sword (or Sabre). Indoor Students within this level have learned Tai Chi for over ten years and can practice Tai Chi Eleven Form, 18 form, Laojia Form or 83 Form with Push Hands, Sword, Sabre, Spear, Fan, Long Pole with Martial Arts applications.